Assam Congress finds it tough to arrange choppers for star campaigners! As all the political parties in Assam have geared up to campaign for the ensuing Lok Sabha polls 2019, the Congress is also not lagging behind. But the Assam unit of the opposition Congress is reportedly finding it tough to arrange choppers to transport the party’s star campaigners for the parliamentary elections in the State. A report published by Economic Times stated that the Congress is scouting for choppers from West Bengal, Delhi and Jharkhand as most of the choppers in Assam have been booked by the other political parties and the rental charges have suddenly increased. The report said during the election to the 16th Lok Sabha held in 2014, the Congress had hired two helicopters for election campaigning. However, to campaign for the ensuing Lok Sabha polls 2019, the party has managed to get only one chopper, which will be used by former Assam chief minister and senior party leader Tarun Gogoi. Gogoi, who heads the campaign committee of the Congress, will make aerial tour in different corners of Assam, said the report. 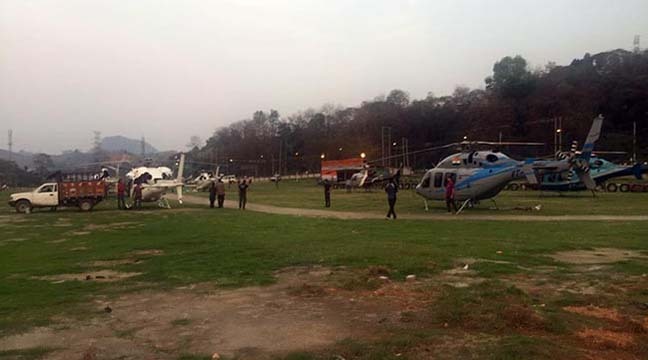 During the panchayat elections held recently in Assam, chief minister Sarbananda Sonowal and finance minister Himanta Biswa Sarma, who is also the convener of BJP-led North East Democratic Alliance (NEDA) made extensive use of choppers. Ex-Assam chief minister Gogoi vehemently attacked Sonowal for extensive use of chopper during the panchayat election. In Assam, the Lok Sabha polls will be held in three phases – April 11, April 18 and April 24, 2019. In the first phase (April 11), the polling will be held in Tezpur, Dibrugarh, Lakhimpur and Kalibor Lok Sabha constituencies. In the third phase (April 24), polling will be held in Dhubri, Barpeta, Kokrajhar and Guwahati Lok Sabha constituencies.